Aims: The Families, Adolescents and Children's Teamwork Study (FACTS) is a family-centred structured education programme for children and adolescents with Type 1 diabetes. It aims to integrate group-based diabetes education into routine care, enhance parental responsibility for self management and improve glycaemic control. Methods: A randomized wait-list control group study allocated participants to either the immediate (four educational sessions during year 1) or delayed intervention (four educational sessions during year 2). In both groups, glycated haemoglobin (HbA1c) was measured 3-monthly and participants completed the Paediatric Quality of Life Inventory (PedsQL), Problem Areas in Diabetes Scale (PAID) and Diabetes Family Responsibility Questionnaire (DFRQ) before and after the intervention. Results: Intention-to-treat analysis showed no significant difference in HbA1c or parental responsibility between participants randomized to the immediate or delayed programme. However, during 12 months' follow-up, families who attended ≥ 2 sessions reported increased parental involvement (P = 0.01), and in children/adolescents who attended ≥ 2 sessions HbA1c fell by 0.29% compared with an increase of 0.11% in non-attenders (P = 0.04). 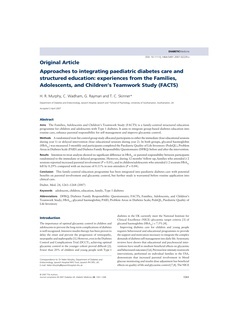 Conclusion: This family-centred education programme has been integrated into paediatric diabetes care with potential benefits on parental involvement and glycaemic control, but further study is warranted before routine application into clinical care. © 2007 The Authors.